As this winter season is in full swing with colder than normal temperatures around the country, we here in Florida have continued to see sunny skies despite the cooler temperatures. I would like to share with you our continued successes over this past year as our department continues to grow and flourish. 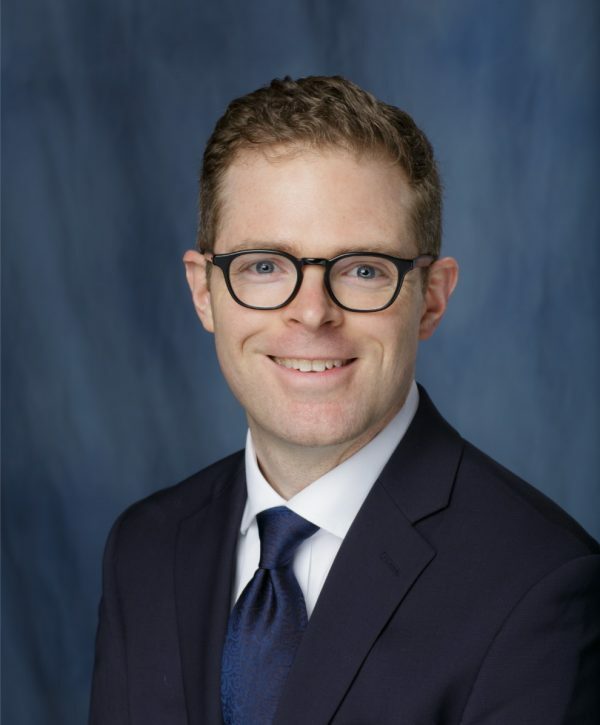 Our faculty complement has increased to 16 with the addition of Chris Bayne, MD (pediatric urology) and Padraic O'Malley, MD (urologic oncology). This year, we anticipate additional hires in general urology (Michael Wehle, MD) and male infertility (Amanda Reed-Maldonado, MD). 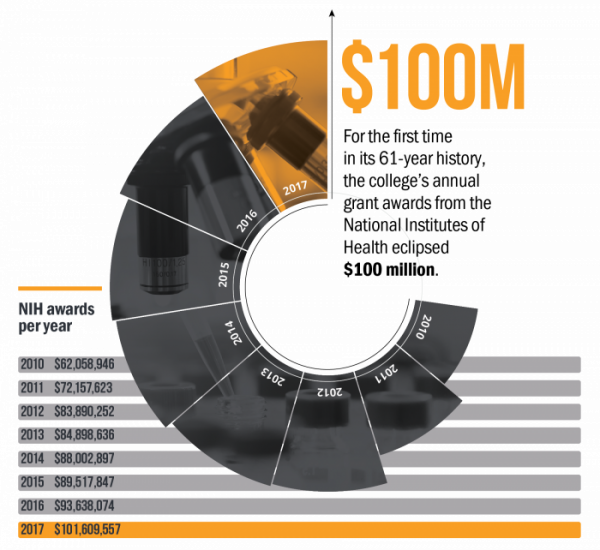 From an institutional perspective, the UF College of Medicine has eclipsed the $100M dollar NIH research grant award amount this year. This past October, the UF Health Urology program celebrated the 60th anniversary of our residency training program. Over 140 alumni and guests returned to Gainesville to recount our rich heritage and contributions to the field. This was in conjunction with our annual David M. Drylie Visiting Professor event with our special guest this year being Dr. Steve Nakada, the David T. Uehling Professor and Chair of Urology. I am excited to be part of such a vibrant faculty and urology residency training program. It's great to be a UroGator! As you may be aware, it is nearing the time of year when U.S. News & World Report solicits input and nominations on the Best Hospitals and Best Children’s Hospitals rankings through the annual reputation survey (Doximity). UF Health Urology places a high value on this recognition, which informs patients, our community and our physician partnerships of the commitment and excellence provided in urologic care by our team of physicians and providers. In keeping with UF Health’s overarching missions, we remain committed to our primary focus of providing outstanding patient-centered care, conducting innovative research, and training tomorrow’s leaders. Doximity non-members will be surveyed between January and March. Doximity members will be surveyed in late February and March. If you feel UF Health Shands Hospital and UF Health Urology is one of the nation’s top hospitals for providing care to adult and/or pediatric urology patients who have challenging urologic conditions, please cast your vote. Dr. Bayne comes to us after completing his fellowship in Pediatric Urology at Children’s National Hospital in Washington, D.C. Dr. Bayne is a graduate of Eastern Virginia Medical School, in Norfolk, VA and completed his urology residency at George Washington, in Washington, D.C.
with spina bifida, and minimally invasive surgery. We are delighted to welcome Dr. Bayne and his family to Gainesville and the UroGator Family! 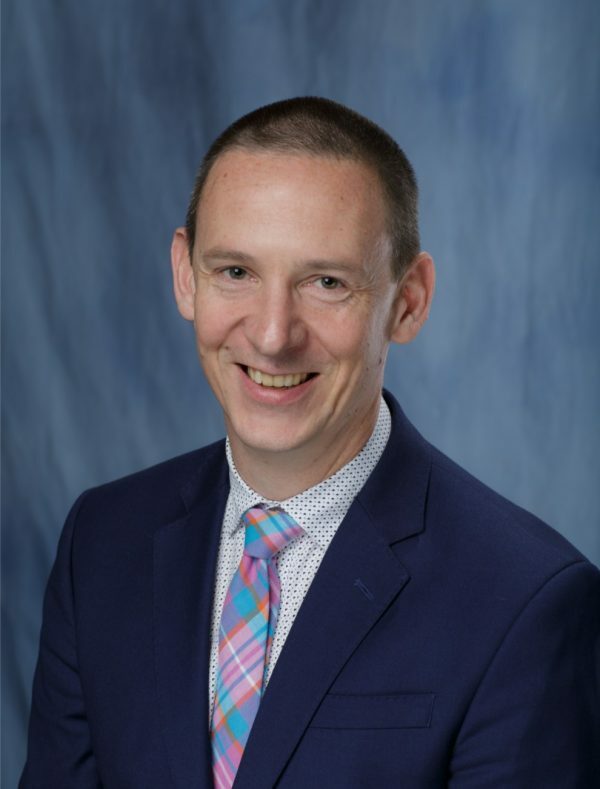 Click here to learn more about Dr. Chris Bayne. 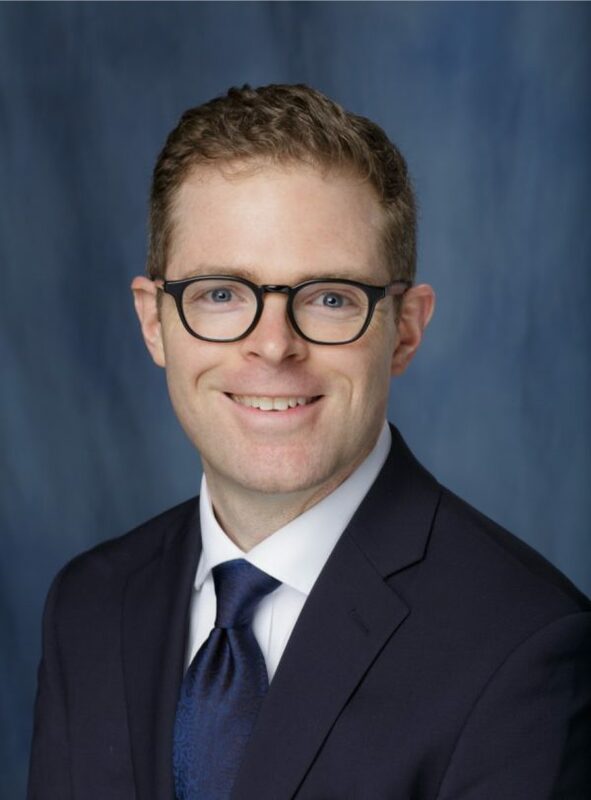 Dr. O’Malley comes to us after completing his fellowship in Urological Oncology (Society of Urological Oncology) at Weill Cornell Medical College and New York Presbyterian Hospital, New York, NY. 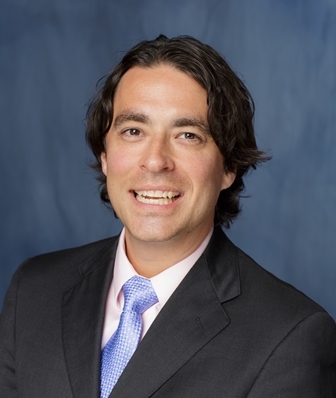 Dr. O'Malley is a graduate of Saba University School of Medicine, Dutch Antilles and he completed his urology residency at University of Toronto, Toronto, Canada. 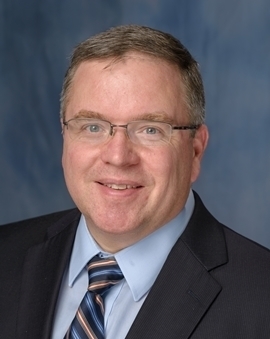 Dr. O’Malley’s clinical interests include urologic oncology, bladder cancer, kidney cancer, testicular cancer, penile cancer, prostate cancer, robotic surgery and continent diversions. We are delighted to welcome Padraic and Shannon to Gainesville and the UroGator Family! 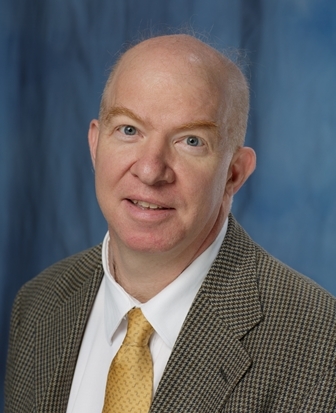 Click here to learn more about Dr. Padraic O'Malley. 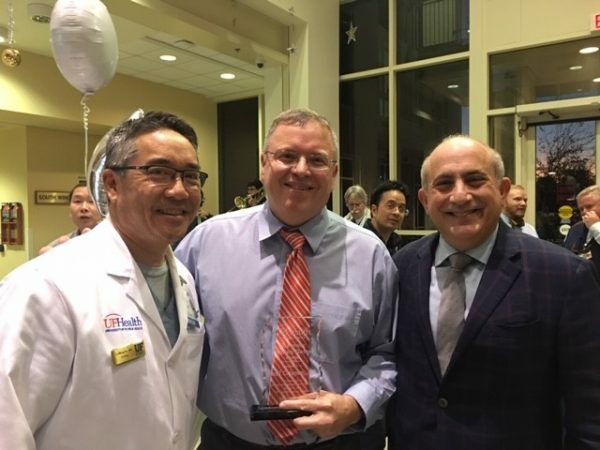 Wednesday, January 9th, Dr. Paul Crispen was awarded the Golden Gator Award by UF Health Cancer Center Director Dr. Jonathan Licht for his numerous and consistent contributions and leadership. Please click the links to learn more about Dr. Crispen and the UF Health Cancer Center. Li-Ming Su, MD and colleagues from UF Health and partnering institutions awarded U54 NCI grant to study mitochondrial DNA and mitochondrial-derived peptides and their association with racial differences in prostate cancer. Lawrence L. Yeung, MD promotion to Associate Professor. Congratulations to Lawrence L. Yeung, MD. Mr. Vincent Roth, a first year medical student at UF, was awarded an AUA Summer Medical Student Fellowship grant for a project to study the rates of UTI following office cystoscopy procedures. Data from the project will be one of six abstracts from the UF Department of Urology science lab that will be presented at the 2019 SESAUA meeting in Phoenix, AZ. William Donelan, PhD started his two-year Urology Care Foundation Award in July and has made significant progress in expressing oxalate oxidase, a plant protein that will aid our team in the development of a urine dipstick oxalate test. 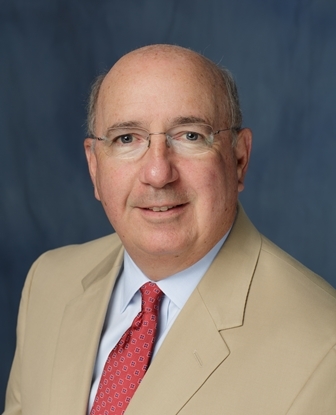 Dr. Dominguez-Gutierrez submitted a grant to the Oxalosis Hyperoxaluria Foundation (OHF) testing a novel oxalate immunotherapy vector for patients with problems of oxalate metabolism. Drs. Sergei Kusmartsev and Paul Dominguez-Gutierrez along with their clinical collaborator Dr. Paul Crispen were awarded an $816,000 research grant through the J&E King Florida Biomedical Research Program. Patient enrollment for the project, entitled “Dissecting the mechanisms of tumor-induced tolerance and immune suppression in bladder cancer,” has already begun. Finally, the lab would like to express our appreciation to everyone within the UF Department of Urology who keep these terrific research projects running: from administrative assistants who order supplies, to the staff who complete grant paperwork and IRBs, to the clinicians who provide patient samples and clinical dollars – thank you for your support. We couldn’t do this without you! To learn more about research at UF Urology, please click here. Bladder cancer will be diagnosed in over 80,000 patients this year in the United States. Of these newly diagnosed patients, many will be recommended to receive BCG therapy to prevent cancer recurrence. In an effort to improve BCG therapy, a clinical trial is being conducted by the South West Oncology Group which includes over 93 sites nationally. At the recent national meeting held in Chicago, the University of Florida was recognized as one of the top 5 enrolling sites of this important trial. This achievement is a reflection of UF Health Cancer Center and our Department's dedication to improving the care of cancer patients every day. 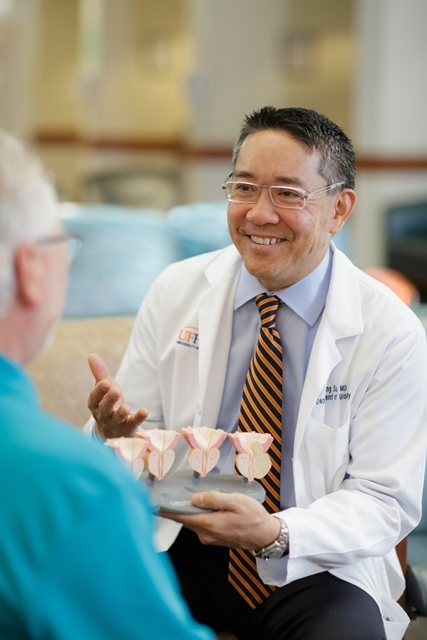 The University of Florida Department of Urology through its Endourology service continues to be a leader in care for patients with urinary stone disease. We offer comprehensive care, both surgical and medical, with the intent of improving overall health and quality of life for patients with this condition. Our approach combines the University of Florida Urology and Nephrology teams in our multidisciplinary clinic for patients with urinary stone disease. Our research team, representing a number of disciplines, including, Urology, Nephrology, Critical Care, Physiology, and Functional Genomics is currently engaged in a number of research endeavors to better characterize and ascertain the causes of urinary stone disease, assess treatment outcomes, and to improve methods for stone prevention. To learn more about urinary stone disease, please click here. 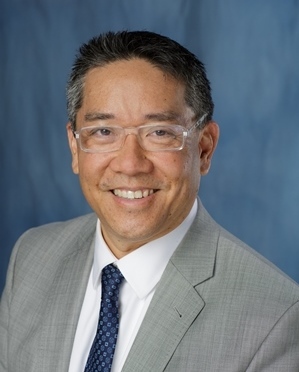 Dr. Larry Yeung is one of the first surgeons in the state of Florida to offer the latest advance in male urinary incontinence surgery with the ProACT™ adjustable balloon system. ProACT™ Adjustable Continence Therapy for Men is indicated for the treatment of adult men who have stress incontinence arising from intrinsic sphincter deficiency of at least twelve months duration following radical prostatectomy or transurethral resection of the prostate (TURP) and who have failed to respond adequately. The ProACT™ therapy consists of two small, adjustable silicone balloons connected with tubing to a port. During a minimally invasive outpatient procedure of approximately 30 minutes, the balloons are surgically placed in the area where the prostate was removed or resected. The fluid-filled balloons provide pressure and support at the bladder neck. The balloon size can be altered through a small port located underneath the skin of the scrotum to adjust the amount of bladder outlet resistance is needed to achieve urinary continence. 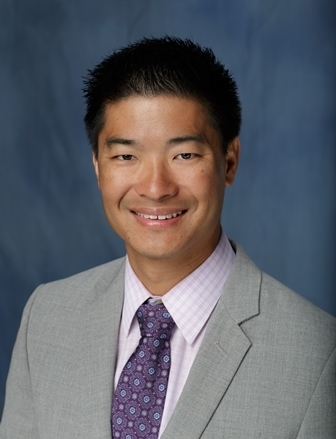 Click the links to learn more about Dr. Yeung and patient care. UF Pediatric Urology the Only Pediatric Surgical Service at UF to Offer Robotic Surgery to Children. The Division of Pediatric Urology utilize the shared experiences of Dr. Romano DeMarco and myself to offer comprehensive open and minimally-invasive surgical approaches to all pediatric urological pathology. We are the only pediatric surgical service at UF to offer robotic surgery to children. Since August, we have twice performed successful robotic surgery on the youngest patients in the history of robotics at UF (5 years-old, and then 4 years-old). These patients are being referred to our center from other institutions specifically for these procedures. We are also excited to extend robotic surgical expertise to young adult patients with primary problems that have traditionally been considered “congenital” or “pediatric” issues. To learn more about Pediatric Urology, please click here. UF Health Urology General Urology now has one of the largest series of UroLift® procedures in the State of Florida. This minimally invasive procedure is improving the voiding function and quality of life in BPH patients as well as freeing them from long term BPH medical therapy. To learn more about General Urology, please click here. through the 2019 Urology Residency Match. For the three positions, there were over three hundred applicants, with sixty four applicants interviewed. These three individuals have displayed outstanding enthusiasm, drive, maturity and work ethic and we are extremely excited to have them join our group of fantastic residents. Our residents have consistently represented our department with outstanding compassion and patient-centered care on a daily basis. We look forward to the development of these three new bright minds. Julia Han, MD will be joining a group practice in Jacksonville, FL upon graduation. Jonathan Pavlinec, MD successfully matched into the University of Florida (UF) Department of Urology Endourology/Minimally Invasive Surgery Fellowship for 2019-2020. Blake Noennig, MD will be joining a group practice in Minneapolis, MN upon graduation. UF Urology just completed resident interviews. We had nearly 300 applicants from across the U.S. and interviewed 50 applicants for 3 urology residency positions. To learn more about our current residents and alumni, please click here. 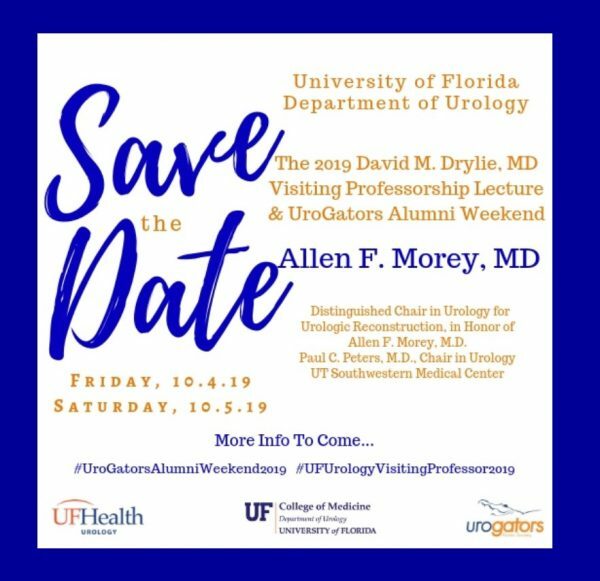 60 years of Urology at the University of Florida. 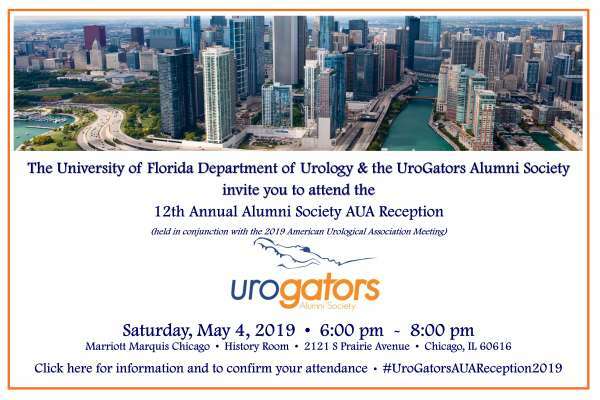 UroGators, including our first graduating resident Dr. Elliot Klorfein, as well as other celebrated alumni (Dr. Dixon Walker, Dr. Zev Wajsman, Dr. Bob Newman and others) were welcomed to an evening of great music, food and memories. 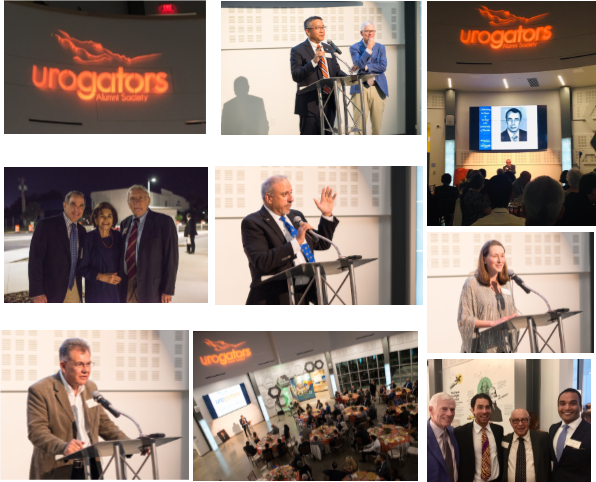 Seeing UroGators of all decades getting to know one another, speaking and sharing memories made it a most special night. To see a recap of the celebration and all events, please click here. The UF Department of Urology is unique in that our physicians and researchers are leaders in all key treatment areas and their ongoing research programs push the boundaries of medical progress. If you would like to be part of a family and a close knit community of multidisciplinary doctors, please click below for more information about our open positions. Let us know. Help us build our online directory. 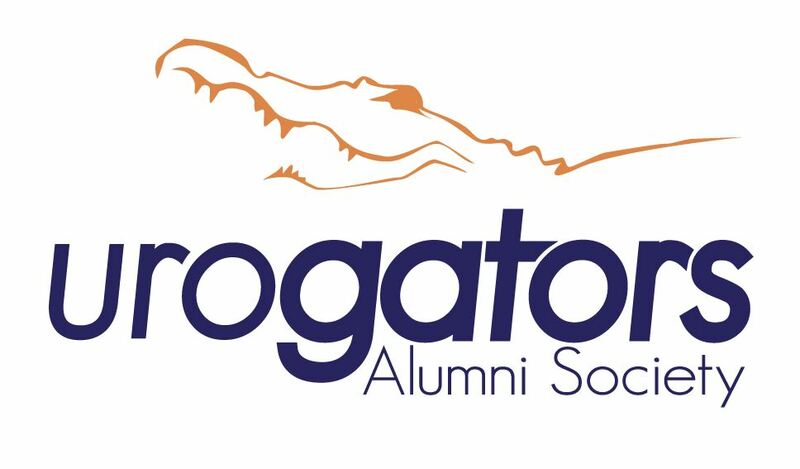 UroGators Alumni Society, please click here.